Districts must do more to ensure low-income and minority students have access to top-notch teachers, says Jenny Demonte, associate director for education research at the Center for American Progress and co-author of the April report"Looking at the Best Teachers and Who They Teach." The report, not surprisingly, found that poor students and students of color are less likely to be taught by a highly effective teacher than are other students. But there are some pockets where change is occurring. Teachers are more equally distributed in Massachusetts than they are in Louisiana, the report found. For example, Massachusetts students in high-poverty schools are 30 percent more likely to be taught by an "exemplary" teacher than are those in low-poverty schools. But in both states, students in the highest-poverty schools were about three times as likely to be taught by the most ineffective teachers as were students in the lowest-poverty schools. Administrators can look to districts with a more equal distribution of teachers for improvement strategies, Demonte says. For example, Ascension Parish Schools in Louisiana is a diverse district of 21,000 students with an almost equal distribution of highly effective teachers. Ascension Superintendent Patrice Pujol credits a professional development program called "TAP: The System for Teacher and Student Advancement." 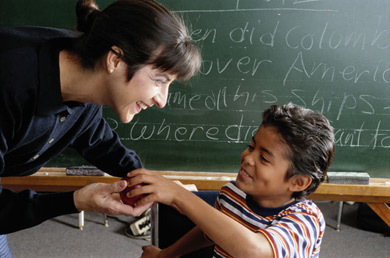 The district focused this program on the most disadvantaged schools to improve teacher quality. It emphasizes offering leadership roles and performance-based pay to strong teachers. Teachers are also given time during the school day to learn new instructional strategies and to share best practices with the help of master teachers. The Department of Education is developing a "50-state strategy" that will entail new state teacher equity plans and investigations of districts and schools by the department's Office for Civil Rights.